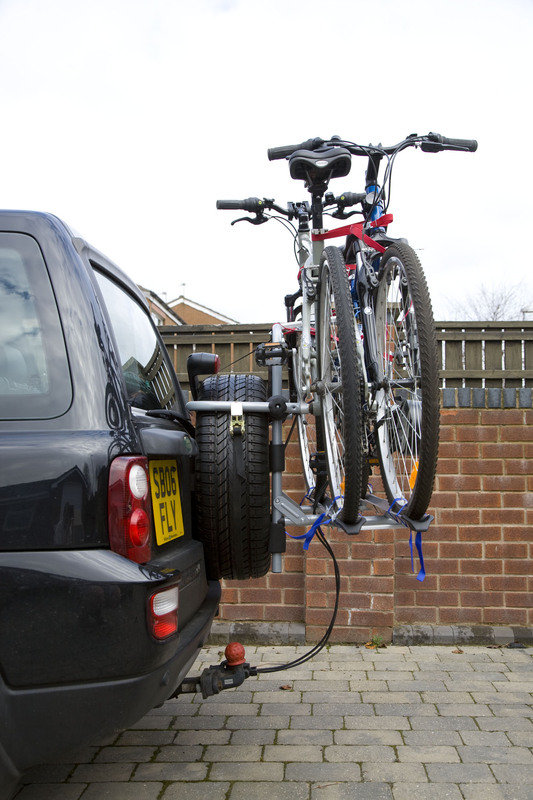 One of the big debates in the caravan world is how to carry your bikes. 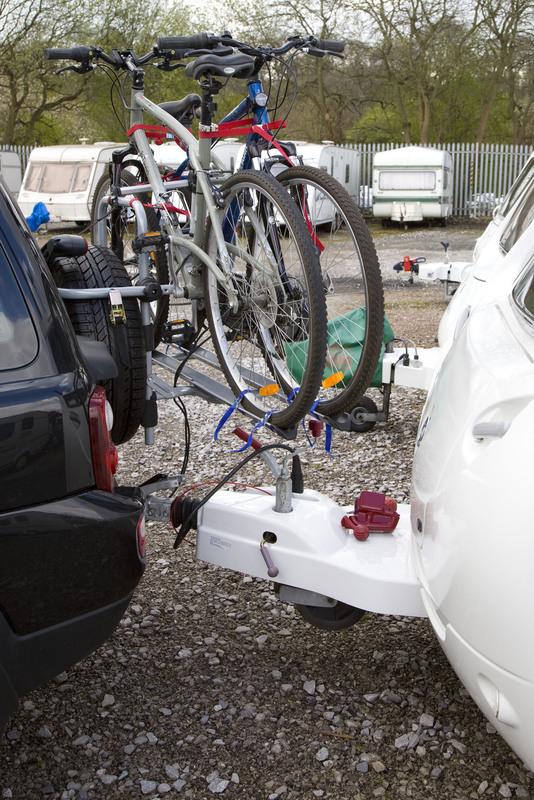 Our continental cousins have the advantage that their caravans come with a longer ‘A’ frame allowing a bike rack to be installed on it. Fiamma have an excellent range dedicated to just that. In the UK though, caravan manufacturers seem to prefer the stubby ‘A’ frame and basically because of this and the fact that UK vans seem to come pre loaded with the weight of a small elephant already on the hitch, we have to come up with alternatives. The old bike rack, even on its highest setting, it would not clear the caravan 'A' frame and it was unstable too. Somehow carrying the bikes on the roof is a bit of an aerodynamic disaster as far as I’m concerned and Sue was adamant that they were not going inside her shiny new caravan so the only place left was to hang them off the back of the Freelander. 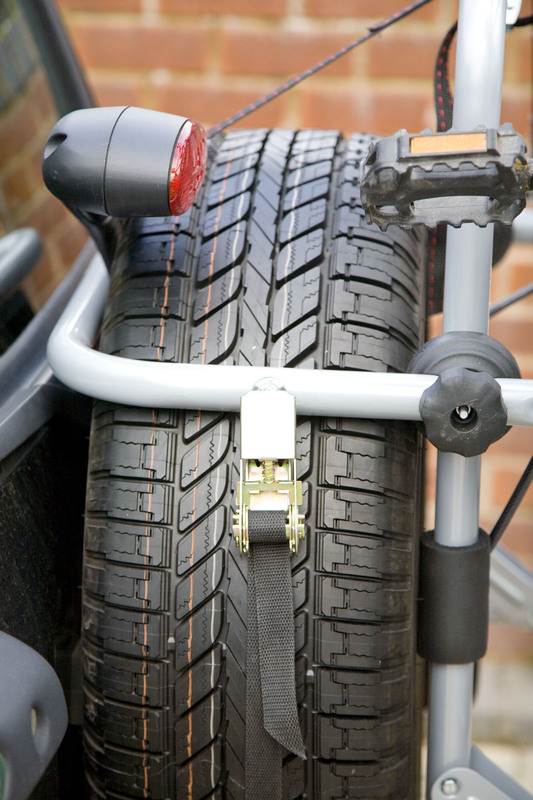 We had a bike rack from a well-known car spares shop that fitted on the spare wheel and up to now had worked fine. The problem was it carried the bikes too low to allow us to tow the caravan. I’d adjusted the frame to lift the bikes as high as I could get them, but it wasn’t right and it seemed unstable. Time to look at alternatives. Fiamma was a logical place to start. 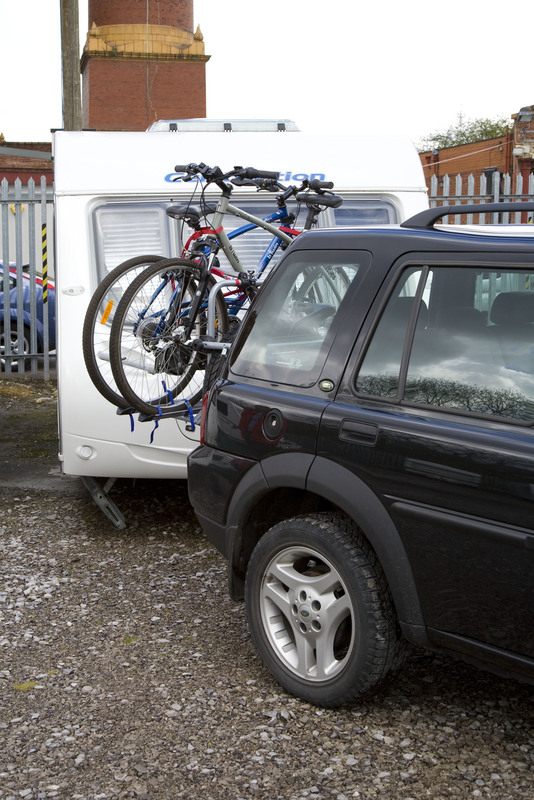 They are well-known for producing equipment for caravans and motorhomes and have a range of bike racks that are designed with this in mind. 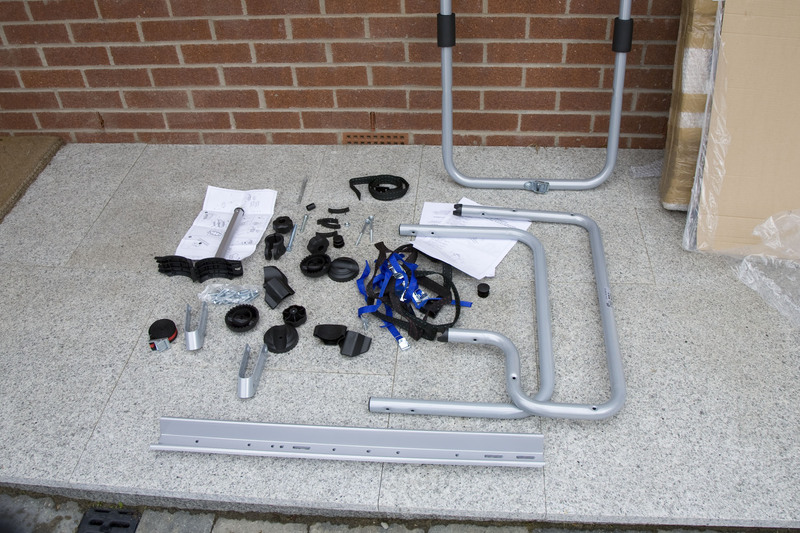 A quick ‘google’ soon brought up a number of outlets selling the 4 x 4 bike rack. A bit more searching and I found a detailed picture of one and a drawing that included all the sizes. 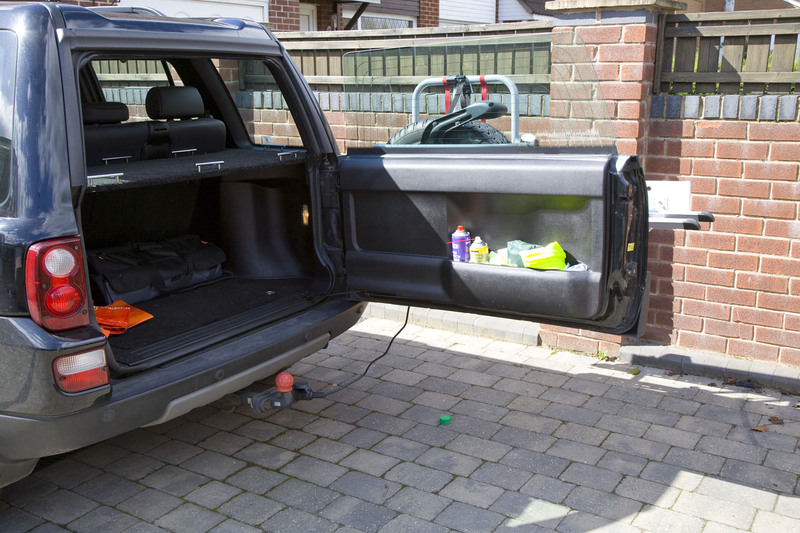 I had a couple of photos of the Freelander hooked up to the caravan and using Photoshop I was able to work out some measurements… I knew the hight of the jockey wheel, the size of the tyre on the Freelander, so I could scale the photo quite accurately and draw some lines to measure the clearances needed. The Fiamma 4 x 4 would do the job, it would just need the bottom rack moving up slightly, but everything else looked OK. I really needed to see one “up close and personal” as they say. Time to find one. On the web, the closest to me was Camperlands and they seemed to have one in stock. Off I set, tape measure and printout in hand to hopefully measure one of the racks. To cut a long story short… in the 2012 Fiamma catalogue, the 4 x 4 were not listed, but they were in the 2011 edition. They didn’t have any. Back home again I started ringing round all the suppliers… “no, they didn’t have any in stock – but they could get them” seemed to be the standard reply. I pointed out they were not in the 2012 catalog and they all said “can we ring you back“. This was Easter bank holiday, so nothing much was going to happen till Tuesday. I was hoping that as we were only four months into 2012, that somewhere one of the retailers or distributors would have one on their shelves. By mid morning Tuesday I’d had a couple of calls back from all the phone calls I’d made over the Easter break. Not good news. I decided to ring the importer directly. “Ahh so you are the one” the person on the end of the phone said. Apparently my ringing all the dealers had set off a chain reaction, they had all in turn been ringing the importer asking about the 4 x 4 carrier and could they order one urgently. “I thought it was strange that nearly every distributer was ringing us asking about a 4 x 4 rack. Unfortunately Fiamma have dropped it from the range as it wasn’t selling enough.” not exactly what I wanted to hear. Bugger… that’s that then. 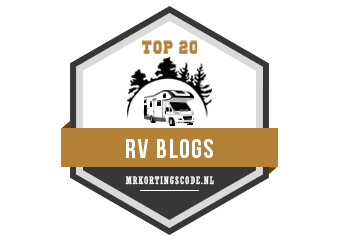 I went back onto the internet… I wondered – the Dutch have more bikes than us and they are into caravans…. I checked on the Fiamma distributer in Holland, nope… they don’t have much call for 4 x 4’s over there so never stocked them. I started googling to see what else there was, but it always came back to the Fiamma rack. If you sell Fiamma kit… please make sure your website is up-to-date! I looked at other options. 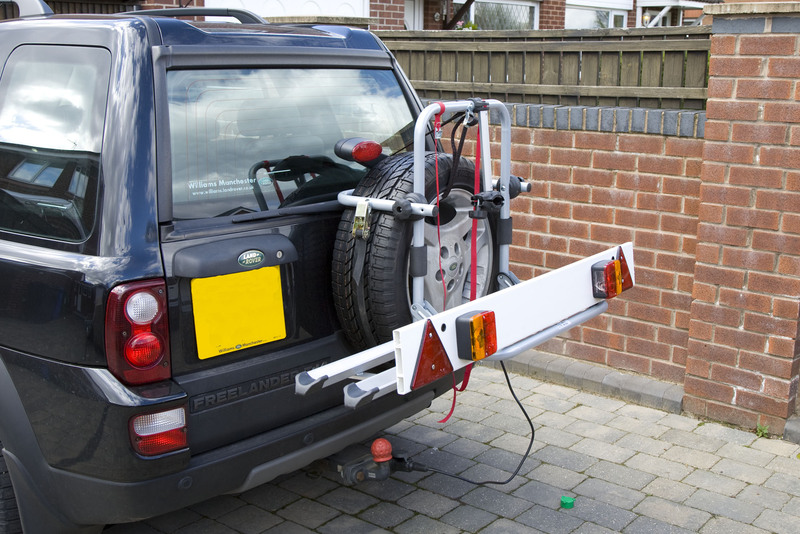 I reconsidered my decision not to look at tow bar mounted racks… nothing would still allow me to tow the caravan. OK, Sue would just have to accept that we were going to have to put the bikes inside the van. 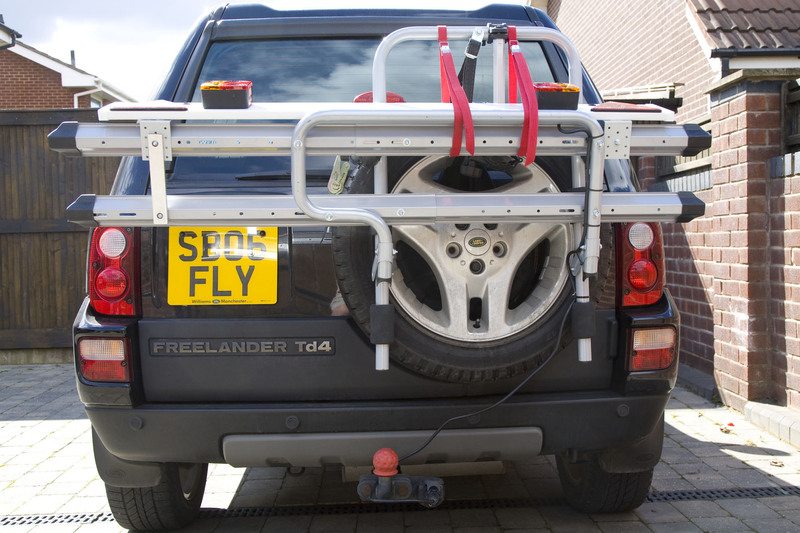 I don’t know what made me do it, but I put the picture of the Fiamma 4 x 4 rack into the image search facility (I use it to find my photos on the internet that people have pinched) It found a lot of Fiamma photos of bike racks…. but it also found another site… Green Valley it was almost identical to the Fiamma 4 x 4 and it was half the price. The company that retails them is called Skidrive.co.uk and after checking the size, one was ordered. 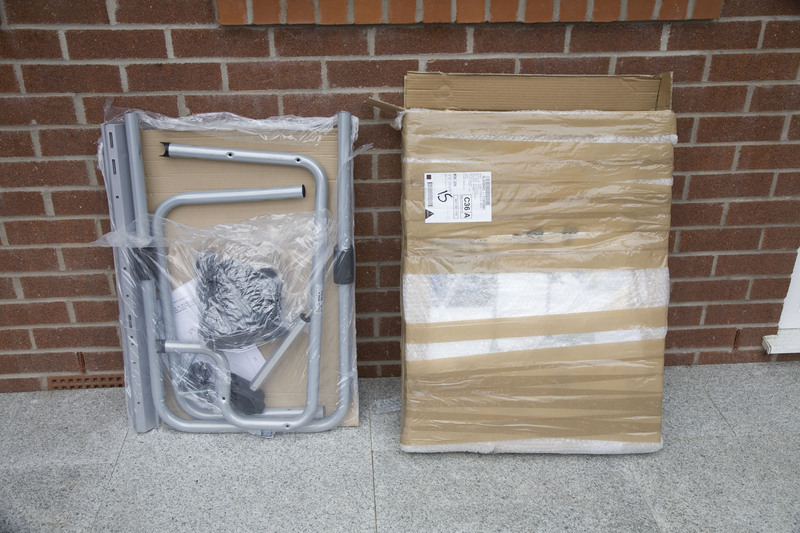 The box arrived 2 days later, like most things now it was a flat pack and required assembling. Not a problem as I’d only have had to take it apart to ‘modify’ it. Opening up the box of parts, I could tell that this was a good quality product. All the nuts were good quality ‘nyloc’ nuts, the washers were all thicker than expected and the plastic mouldings seemed good quality. The only downside was it was made of steel not aluminium, therefore it was heavier, but the upside ment it would be easier to modify and be stronger. The first thing would be to lay out everything and check it was all there, then I could set about with my tape measure. Measuring where the changes needed to be and what sections would need to be changed, surprisingly, only one thing needed to be done and that was to raise the lower rack height to clear the raised jockey wheel. After measuring and marking the frame…. having a cup of coffee and re-measuring the frame, I centre punched the marks and set up the pillar drill in the workshop with vee blocks and the right sized drill and proceeded to reduce parts of the rack into little curls of swarf. 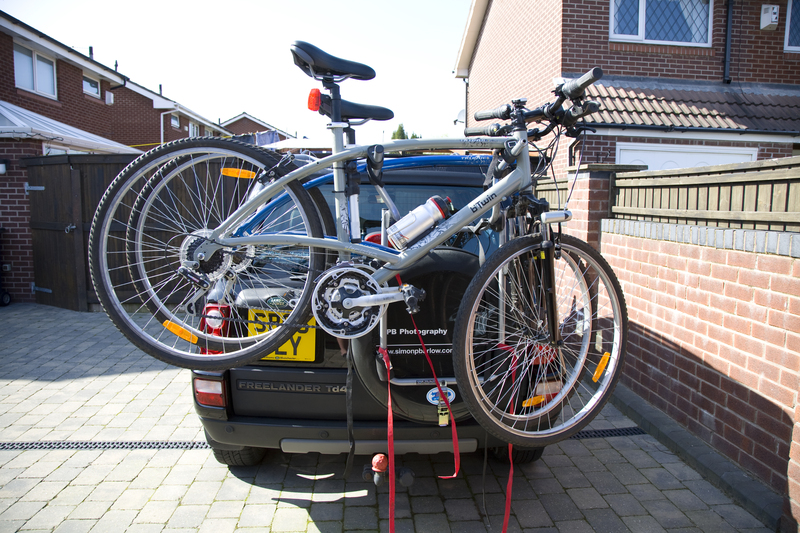 A couple of hours later I had a fully assembled and modified rack mounted on the back of the Freelander with a couple of bikes on it. I had raised the lower platform by 180mm which would give me the clearance that I needed, I’d also moved the offset to centre the bikes on the back of the vehicle, with a slight bias towards the driver side as I could keep an eye on that in a tight right hand turn. The clearance should just be enough to be able to hitch and un-hitch without any problems… not that wearing a hard hat couldn’t solve anyway! The next thing would be to go and to a “test fit” with the caravan. That would be the acid test, could I get full lock without putting a wheel through the front window? So with bikes strapped on, temporary light board (no number plate for the moment!) Sue and I set off down to where we store the caravan. Rather than hitch up and drive the van round, I thought it safer to raise the hitch head so that it just cleared the tow ball using the jockey wheel, adjust the stabilisers to keep the caravan in that position, the raise the jockey wheel to it’s normal towing position i.e. wound right up and lifted on the ‘A’ frame to its highest position. I could then reverse on at a series of angles, with Sue directing me so that the tow ball was directly under the hitch. I checked for initial clearance first be reversing on ‘square’. So, success! all seemed to fit together and it looks like we won’t have any clearance problems once I have removed the winding handle from the jockey wheel. Now all that needs doing is to finish the rack with a few “upgrades” and weigh it and the bikes. 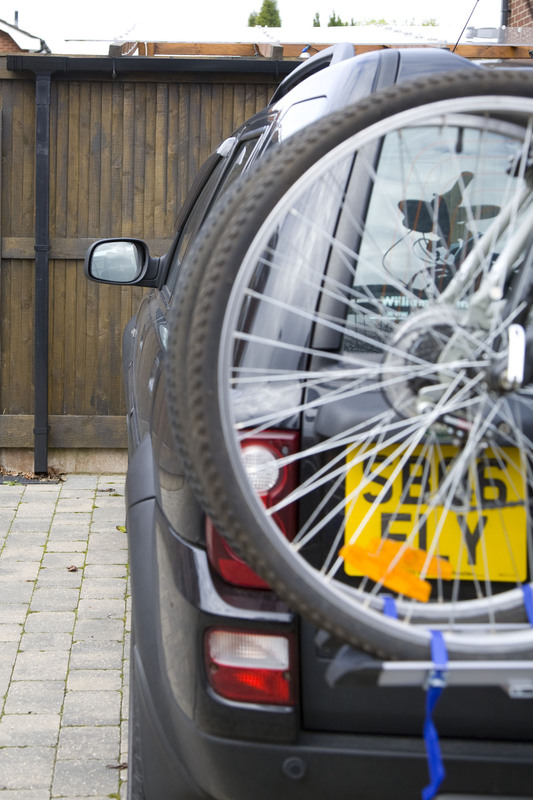 One of the problems with carrying bikes is not just where to put them, but how to account for the weight. Put them in the caravan, and it adds weight possibly affecting nose weight, and people know about this and adjust things hopefully. 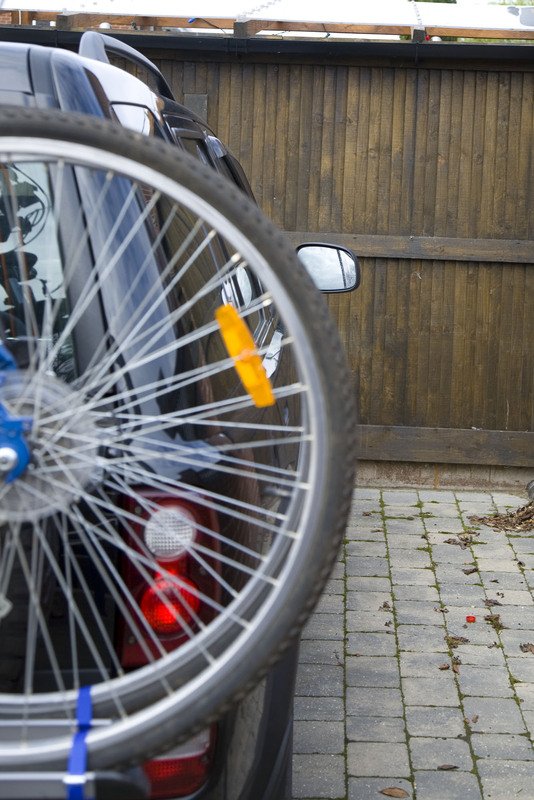 people with cars often mount the bikes on the tow ball, and they know that the weight will have to be deducted from the nose wight that can be placed on the hitch. 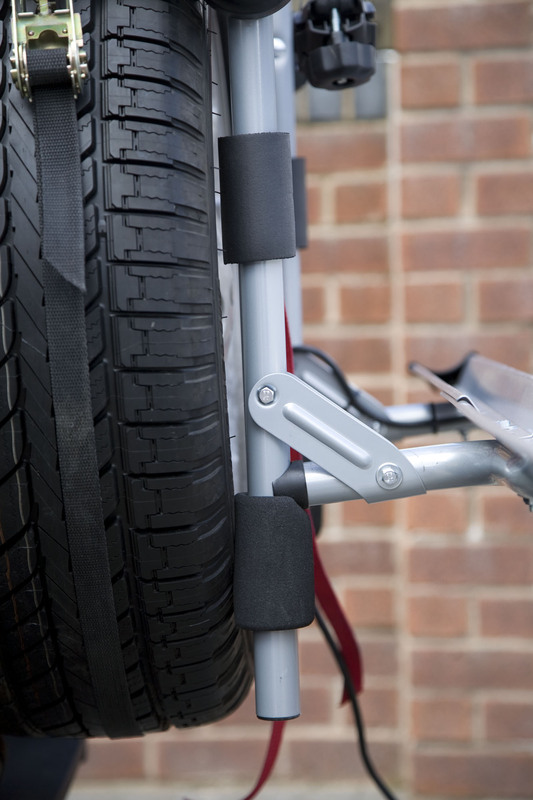 Now, the guys like me that hang the bikes off the spare wheel or mount them on the roof also have to take into account the weight. For me, I will know the weight of the finished rack and the bikes and I also know the distance from the back axle so I can now calculate the additional loading on the back axle. 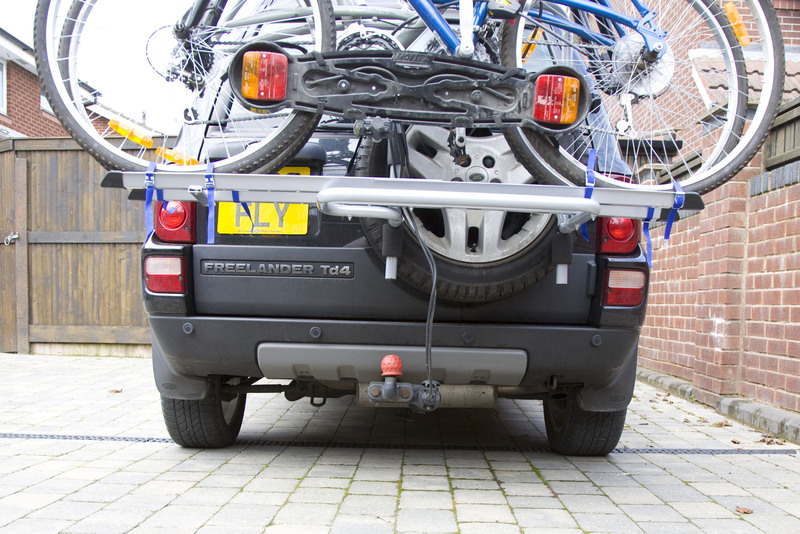 For my Freelander, according to the VIN plate, the maximum loading on the rear axle is 1460 Kg’s – So, with a maximum nose weight on the hitch of 140Kg’s and the bike rack and two bikes, full fuel and 80Kg in the rear load space, I am still under the maximum rear axle load. 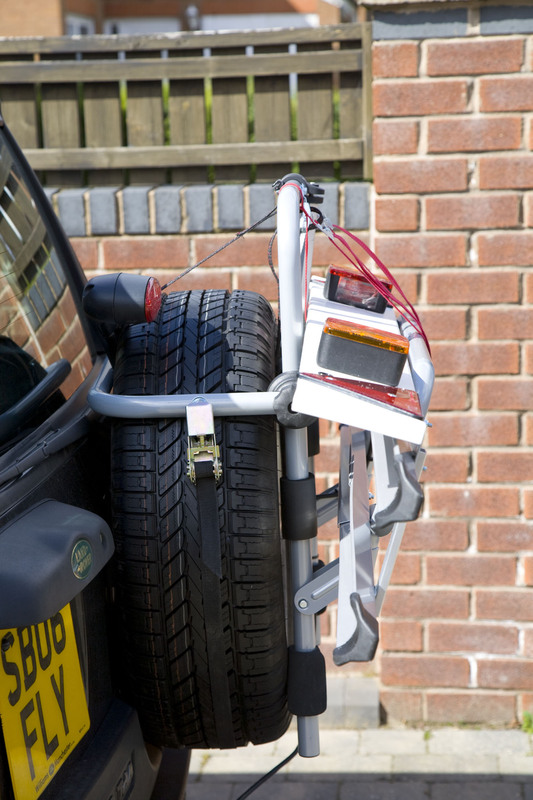 We can only have a maximum of 100Kg nose weight with the Al-Ko hitch on the van, so we have quite a big safety margin. The first one was a strap ratchet to allow me to tighten it onto the spare wheel. This simple little device will secure the rack beyond what the supplied fitting could do. I also relocated it so it pulled squarely on the tyre. For safety, I also installed a top strap that would loop through the tyre and rim that would take out any pitching tendency. By the way, if you want to see any of these photos in more detail, just click on them. Next was the light board. I did wonder if I should have a hinged affaire that could swing down so that when the rack was in its stored position on the vehicle it could still be seen. And several cups of coffee later I decided that it was highly unlikely that we’d ever drive about with it in its stored position and anyhow, the rear lights are visible and the car number plate is almost all visible to following vehicles. I also installed a couple of straps to the top of the frame and a stiffening bracket to the left hand side of the wheel trays to take out any tendency they had to twist slightly as I had offset them to the left to make sure the bikes were almost in the centre of the vehicle. If you are wondering why I removed the registration in this photo... it was too clear for the text reading bots to detect. One of the other criteria for the rack was also to allow a box to be carried that would allow me to carry some of my photographic light stands and working gazebo if required, it also allows me to still tow our small 750Kg utility trailer as well. The light board is a commercially available one from Go Outdoors (£14.99) and I made a couple of modifications to it before installing. I shortened the lead so that it was just long enough to allow me to open the back door to its full extent. I also changed the 12N plug it came with for a 13 Pin plug. I don’t fancy the idea of someone walking off with our bikes or the rack if we are off cycling somewhere, the bikes are not expensive ones but they are ours, so I have built-in a number of security features and I’m not going to tell you what or where and they are not shown on the photographs. I’ll leave you with a selection of photos of the rack incase you want to have a go yourself and make your own Bicycle Conveyance Contrivance. Very good point and I have thought about it. If the ramp or incline is taken straight on, I think I will have enough clearance for about 35 to maybe 40 degrees so should be OK. 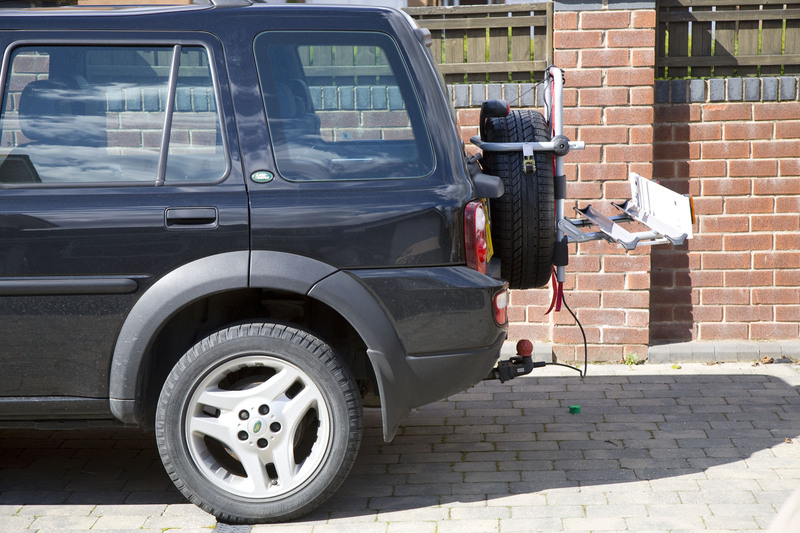 Looking at it, as the back of the car drops the tow ball will lower the front and I think that the jockey wheel will be almost touching the ground as the bike rack touches the top of the jockey wheel. I can remove the jockey wheel altogether and that will give enough clearance top and bottom. It’s not an easy one to test! If it becomes a problem, I’ll look at a shorter length jockey wheel.